1950's vintage mid century era earrings. 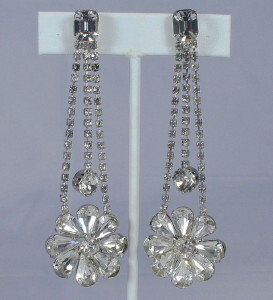 Clear rhinestones, rhodium plated base metal. Large daisy centerpiece with tear-drop shape petals surrounding large center round. Three small round rhinestone extensions. Large round at center extension. Emerald stone button front at clip backs. All original mid century era, true 1950's vintage. Excellent condition. Shows some discolor to rhinestones, consistent with age.